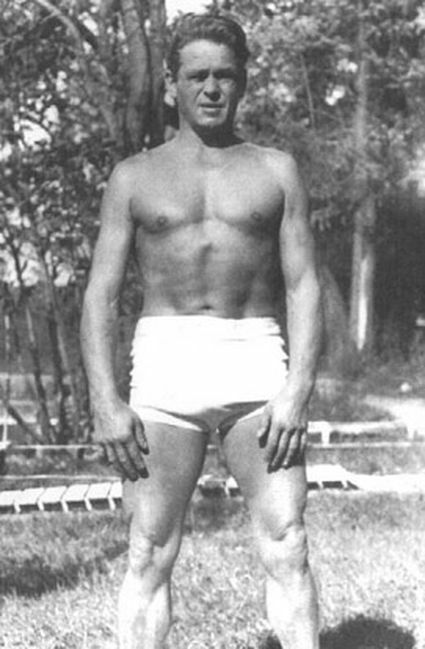 Joseph Pilates, the founder of the physical fitness system which bears his name, was probably the most famous ex-internee from Knockaloe and it was here where he developed the techniques which would later form the foundation of his method. His early life remains obscure and somewhat mythologised, however it is generally supposed that he was born in a small town on the outskirts of Düsseldorf (Germany). Although a sickly child, plagued by asthma, rickets and a string of other illnesses he had a keen interest in body-building, gymnastics and other sports. It is often suggested that both his father (a gymnast) and mother (a naturopath) were highly influential in the development of these, and later, interests; although it is also suggested that “a lot of his philosophy is based on the rational, technocratic and even nationalist ideals prevalent in the physical education of the time…. As a result of the tumultuous changes taking place in society, one way of looking for answers or alternatives was to idealize the past.” (Rouhiainen 2010: 62). He continued these childhood interests through into his adult life making a varied living as a sometimes gymnast, diver and body-builder of some notoriety in his native Germany. Like many in his native country at this time, and perhaps influenced by his mother, Pilates developed a keen interest in Eastern spiritualism and practice which proved to be enormously influential. Like many of his contemporaries Pilates chose to leave his native Germany to seek his fortune, probably sometime after 1910, moving to England in search of employment and perhaps also to further his career. What Pilates did when he arrived in England is somewhat obscure and while some sources suggest he joined the circus (along with his brother), others propose that he worked as a boxer and self-defence teacher for Britain’s growing police force. At the outbreak of World War I Pilates, like many German nationals following the passing of the Defence of the Realm Act (1914) was interned, initially in Lancaster and then subsequently at Knockaloe (1915). It is believed that it was during this period of incarceration that Pilates developed the techniques that would later become the foundation of the physical fitness system (or as he called it ‘contrology’) with which he became synonymous. During his time at Knockaloe he is supposed to have worked in the camp hospital where he brought his new techniques into practice working with the sick and injured, indeed it has even been mooted that the implementation of his techniques were responsible for negating the effects of the 1918 flu epidemic within the camp (Menezes 2006: 1). It is mooted that Pilates’ taught some 8,000 internees his technique (Gallagher and Kryzanowska 2000), although such claims remain unsubstantiated. Whilst in the camp he is also supposed to have developed prototypes for modern resistance exercise equipment using springs from patient’s beds to help rehabilitation, these he later developed and patented as his ‘trap table’ (Menezes 2006). Unfortunately, much information on Pilates’ life in Knockaloe remains anecdotal. Following the war Pilates was repatriated to Germany where he continued to teach self-defence, although this time working with the Hamburg Police, working with dance and physical education specialists to develop the Pilates method. Escaping the inter-war depression in Germany he emigrated to the United States in 1926 where he opened a popular fitness club which taught the Pilates technique and continued to flourish until the 1960s. The club attracted some world famous clients, including dancers Martha Graham and George Balanchine. Pilates’ also wrote several books on the technique and taught a number of disciples who taught variations of his methods. Pilates died 1967 at the age of 83. Anon. (n.d.) Joseph Pilates and the History of Pilates. http://www.pilates.com/BBAPP/V/pilates/origins-of-pilates.html (accessed 16 March 2013). Gallagher, S. and R, Kryzanowska. (2000). The Joseph H. Pilates Archive Collection: Photographs, Writings and Designs. Bainbridge Books: Philadelphia. Menezes, A. (2006). The complete guide to Joseph H. Pilates’ Techniques of Physical Conditioning. Hunter House: Alameda, California. Rouhiainen, L. (2010). ‘The evolvement of the Pilates method and its relation to the somatic field’. Nordic Journal of Dance 2 (pp. 57-69).